The Council of Chalcedon (/kælˈsiːdən, ˈkælsɪdɒn/) was a church council held from 8 October to 1 November, 451, at Chalcedon. The Council was called by Emperor Marcian to set aside the 449 Second Council of Ephesus. Its principal purpose was to assert the orthodox catholic doctrine against the heresy of Eutyches and the Monophysites, although ecclesiastical discipline and jurisdiction also occupied the council's attention. The council is numbered as the fourth ecumenical council by the Catholic Church, the Eastern Orthodox Church, and most Protestants. Oriental Orthodox Churches do not agree with the conduct and the proceedings of the Council, commonly calling it "Chalcedon, the Ominous". About two years after Cyril of Alexandria's death in 444, an aged monk from Constantinople named Eutyches began teaching a subtle variation on the traditional Christology in an attempt to stop what he saw as a new outbreak of Nestorianism. He claimed to be a faithful follower of Cyril's teaching, which was declared orthodox in the Union of 433. Cyril had taught that "There is only one physis, since it is the Incarnation, of God the Word." Cyril had apparently understood the Greek word physis to mean approximately what the Latin word persona (person) means, while most Greek theologians would have interpreted that word to mean natura (nature). The energy and imprudence with which Eutyches asserted his opinions led to his being misunderstood. Thus, many understood Eutyches to be advocating Docetism, a sort of reversal of Arianism —where Arius had denied the consubstantial divinity of Jesus, Eutyches seemed to be denying that Jesus was fully human. Pope Leo I wrote that Eutyches' error seemed to be more from a lack of skill than from malice. Eutyches had been accusing various personages of covert Nestorianism. In November 448, Flavian, Bishop of Constantinople held a local synod regarding a point of discipline connected with the province of Sardis. At the end of the session of this synod one of those inculpated, Eusebius, Bishop of Dorylaeum, brought a counter charge of heresy against the archimandrite. Eusebius demanded that Eutyches be removed from office. Flavian preferred that the bishop and the archimandrite sort out their differences, but as his suggestion went unheeded, Eutyches was summoned to clarify his position regarding the nature of Christ. Eventually Eutyches reluctantly appeared, but his position was considered to be theologically unsophisticated, and the synod finding his answers unresponsive condemned and exiled him. Flavian sent a full account to Pope Leo I. Although it had been accidentally delayed, Leo wrote a compendious explanation of the whole doctrine involved, and sent it to Flavian as a formal and authoritative decision of the question. Eutyches appealed against the decision, labeling Flavian a Nestorian, and received the support of Pope Dioscorus I of Alexandria. John Anthony McGuckin sees an "innate rivalry" between the Sees of Alexandria and Constantinople. 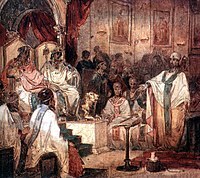 Dioscurus, imitating his predecessors in assuming a primacy over Constantinople, held his own synod which annulled the sentence of Flavian, and absolved Eutyches. Through the influence of the court official Chrysaphius, godson of Eutyches, in 449, the competing claims between the Patriarchs of Constantinople and Alexandria led Emperor Theodosius II to call a council which was held in Ephesus in 449, with Dioscorus presiding. Pope Leo sent four legates to represent him and expressed his regret that the shortness of the notice must prevent the presence of any other bishop of the West. He provided his legates, one of whom died en route, with a letter addressed to Flavian explaining Rome's position in the controversy. Leo's letter, now known as Leo's Tome, confessed that Christ had two natures, and was not of or from two natures. On August 8, 449 the Second Council of Ephesus began its first session. The Acts of the first session of this synod were read at the Council of Chalcedon, 451, and are thus preserved. The remainder of the Acts (the first session being wanting) are known through a Syriac translation by a Monophysite monk, written in the year 535 and published from a manuscript in the British Museum. Nonetheless, there are somewhat different interpretations as to what actually transpired. The question before the council by order of the emperor was whether Flavian, in a synod held by him at Constantinople in November, 448, had justly deposed and excommunicated the Archimandrite Eutyches for refusing to admit two natures in Christ. Dioscorus began the council by banning all members of the November 448 synod which had deposed Eutyches from sitting as judges. He then introduced Eutyches who publicly professed that while Christ had two natures before the incarnation, the two natures had merged to form a single nature after the incarnation. Of the 130 assembled bishops, 111 voted to rehabilitate Eutyches. Throughout these proceedings, Hilary (one of the papal legates) repeatedly called for the reading of Leo's Tome, but was ignored. The Eastern Orthodox Church has very different accounts of The Second Council of Ephesus. Pope Dioscorus requested deferring reading of Leo's Tome, as it was not seen as necessary to start with, and could be read later. This was seen as a rebuke to the representatives from the Church of Rome not reading the Tome from the start. Dioscorus then moved to depose Flavian of Constantinople and Eusebius of Dorylaeum on the grounds that they taught the Word had been made flesh and not just assumed flesh from the Virgin and that Christ had two natures. When Flavian and Hilary objected, Dioscorus called for a pro-monophysite mob to enter the church which assaulted Flavian as he clung to the altar. Flavian died three days later. Dioscorus then placed Eusebius of Dorylaeum under arrest and demanded the assembled bishops approve his actions. Fearing the mob, they all did. The papal legates refused to attend the second session at which several more orthodox bishops were deposed, including Ibas of Edessa, Irenaeus of Tyre, Domnus of Antioch, and Theodoret. Dioscorus then had Cyril of Alexandria's Twelve Anathemas declared orthodox with the intent of condemning any confession other than one nature in Christ. According to a letter to the Empress Pulcheria collected among the letters of Leo I, Hilary apologized for not delivering to her the pope's letter after the synod, but owing to Dioscurus, who tried to hinder his going either to Rome or to Constantinople, he had great difficulty in making his escape in order to bring to the pontiff the news of the result of the council. Hilary, who later became pope and dedicated an oratory in the Lateran Basilica in thanks for his life, managed to escape from Constantinople and brought news of the council to Leo who immediately dubbed it a "synod of robbers"—Latrocinium—and refused to accept its pronouncements. The decisions of this council now threatened schism between the East and the West. The claims that bishops being forced to approve actions, were challenged by Pope Dioscorus and the Egyptian Bishops at Chalcedon. The situation continued to deteriorate, with Leo demanding the convocation of a new council and Emperor Theodosius II refusing to budge, all the while appointing bishops in agreement with Dioscorus. All this changed dramatically with the Emperor's death and the elevation of Marcian, an orthodox Christian, to the imperial throne. To resolve the simmering tensions, Marcian announced his intention to hold a new council to set aside the 449 Second Council of Ephesus which was named the "Latrocinium" or "Robber Council" by Pope Leo. Pulcheria, the sister of Theodosius, may have influenced this decision, or even made the convention of a council a requirement during her negotiations with Aspar, the magister militum, to marry Marcian. Leo had pressed for it to take place in Italy, but Emperor Marcian instead called for it to convene at Chalcedon, because it was closer to Constantinople, and would thus allow him to respond quickly to any events along the Danube, which was being raided by the Huns under Attila. The council opened on October 8, 451. Marcian had the bishops deposed by Dioscorus returned to their dioceses and had the body of Flavian brought to the capital to be buried honorably. The Emperor asked Leo to preside over the council, but Leo again chose to send legates in his place. This time, Bishops Paschasinus of Lilybaeum and Julian of Cos and two priests Boniface and Basil represented the western church at the council. The council was attended by about 520 bishops or their representatives and was the largest and best-documented of the first seven ecumenical councils. All the sessions were held in the church of St. Euphemia, Martyr, outside the city and directly opposite Constantinople. As to the number of sessions held by the Council of Chalcedon there is a great discrepancy in the various texts of the Acts, also in the ancient historians of the council. Either the respective manuscripts must have been incomplete; or the historians passed over in silence several sessions held for secondary purposes. According to the deacon Rusticus, there were in all sixteen sessions; this division is commonly accepted by scholars, including Karl Josef von Hefele, an historian of the councils. If all the separate meetings were counted, there would be twenty-one sessions; several of these meetings, however, are considered as supplementary to preceding sessions. Paschasinus refused to give Dioscorus (who had excommunicated Leo leading up to the council) a seat at the council. As a result, he was moved to the nave of the church. Paschasinus further ordered the reinstatement of Theodoret and that he be given a seat, but this move caused such an uproar among the council fathers, that Theodoret also sat in the nave, though he was given a vote in the proceedings, which began with a trial of Dioscorus. Marcian wished to bring proceedings to a speedy end, and asked the council to make a pronouncement on the doctrine of the Incarnation before continuing the trial. The council fathers, however, felt that no new creed was necessary, and that the doctrine had been laid out clearly in Leo's Tome. They were also hesitant to write a new creed as the First Council of Ephesus had forbidden the composition or use of any new creed. Aetius, deacon of Constantinople then read Cyril's letter to Nestorius, and a second letter to John of Antioch. The bishops responded, "We all so believe: Pope Leo thus believes ... we all thus believe. As Cyril so believe we, all of us: eternal be the memory of Cyril: as the epistles of Cyril teach such is our mind, such has been our faith: such is our faith: this is the mind of Archbishop Leo, so he believes, so he has written." Beronician, clerk of the consistory, then read from a book handed him by Aetius, the synodical letter of Leo to Flavian (Leo's Tome). After the reading of the letter, the bishops cried out: This is the faith of the fathers, this is the faith of the Apostles. So we all believe, thus the orthodox believe. ...Peter has spoken thus through Leo. So taught the Apostles. Piously and truly did Leo teach, so taught Cyril. Everlasting be the memory of Cyril. Leo and Cyril taught the same thing, ...This is the true faith...This is the faith of the fathers. Why were not these things read at Ephesus?" However, during the reading of Leo's Tome, three passages were challenged as being potentially Nestorian, and their orthodoxy was defended by using the writings of Cyril. Due to such concerns, the council decided to adjourn and appoint a special committee to investigate the orthodoxy of Leo's Tome, judging it by the standard of Cyril's Twelve Chapters, as some of the bishops present raised concerns about their compatibility. This committee was headed by Anatolius, Patriarch of Constantinople, and was given five days to carefully study the matter. The committee unanimously decided in favor of the orthodoxy of Leo, determining that what he said was compatible with the teaching of Cyril. A number of other bishops also entered statements to the effect that they believed that Leo's Tome was not in contradiction with the teaching of Cyril as well. The council continued with Dioscorus' trial, but he refused to appear before the assembly. However, historical accounts from the Eastern Orthodox Church note that Dioscorus was put under solitary arrest. As a result, he was condemned, but by an underwhelming amount (more than half the bishops present for the previous sessions did not attend his condemnation), and all of his decrees were declared null. Empress Pulcheria (Marcian's wife) told Dioscorus "In my father's time, there was a man who was stubborn (referring to St. John Chrysostom) and you are aware of what was made of him", to which Dioscorus famously responded "And you may recall that your mother prayed at his tomb, as she was bleeding of sickness". Pulcheria is said to have slapped Dioscorus in the face, breaking some of his teeth, and ordered the guards to confine him, which they did pulling his beard hair. Dioscorus is said to have put these in a box and sent them back to his Church in Alexandria noting "this is the fruit of my faith". Marcian responded by exiling Dioscorus. All of the bishops were then asked to sign their assent to the Tome, but a group of thirteen Egyptians refused, saying that they would assent to "the traditional faith". As a result, the Emperor's commissioners decided that a credo would indeed be necessary and presented a text to the fathers. No consensus was reached. Paschasinus threatened to return to Rome to reassemble the council in Italy. Marcian agreed, saying that if a clause were not added to the credo, the bishops would have to relocate. The Committee then sat in the oratory of the most holy martyr Euphemis and afterwards reported a definition of faith which while teaching the same doctrine was not the Tome of Leo. It approved the creed of Nicaea (325), the creed of Constantinople (381; subsequently known as the Nicene Creed), two letters of Cyril against Nestorius, which insisted on the unity of divine and human persons in Christ, and the Tome of Pope Leo I confirming two distinct natures in Christ. The dogmatic definitions of the council are recognized as normative by the Eastern Orthodox and Catholic Churches, as well by certain other Western Churches; also, most Protestants agree that the council's teachings regarding the Trinity and the Incarnation are orthodox doctrine which must be adhered to. The council, however, is rejected by the Assyrian Church of the East and the Oriental Orthodox Churches, the latter teaching rather that "The Lord Jesus Christ is God the Incarnate Word. He possesses the perfect Godhead and the perfect manhood. His fully divine nature is united with His fully human nature yet without mixing, blending or alteration." The Oriental Orthodox contend that this latter teaching has been misunderstood as monophysitism, an appellation with which they strongly disagree but, nevertheless, refuse to accept the decrees of the council, likely as a result of the conduct and the proceedings of the Council. The Eastern Orthodox Churches have, and continue to view the Council as a power struggle by the Church of Rome, given the prominence in theology, spirituality of the Oriental Orthodox Churches in the Early Church and during the first ecumenical councils. Many Anglicans and most Protestants consider it to be the last authoritative ecumenical council. These churches, along with Martin Luther, hold that both conscience and scripture preempt doctrinal councils and generally agree that the conclusions of later councils were unsupported by or contradictory to scripture. The full text of the definition which reaffirms the decisions of the Council of Ephesus, the pre-eminence of the Creed of Nicea (325). [b] It also canonises as authoritative two of Cyril of Alexandria's letters and the Tome of Leo written against Eutyches and sent to Archbishop Flavian of Constantinople in 449. The bishop of New Rome (Constantinople) shall enjoy the same privileges as the bishop of Old Rome, on account of the removal of the Empire. For this reason the [metropolitans] of Pontus, of Asia, and of Thrace, as well as the Barbarian bishops shall be ordained by the bishop of Constantinople. Canon 28 grants equal privileges (isa presbeia) to Constantinople as of Rome because Constantinople is the New Rome as renewed by canon 36 of the Quinisext Council. Pope Leo declared the canon 28 null and void and only approved the canons of the council which were pertaining to faith. The “Holy, Great and Universal Council” simply addressed the bishop of Rome as "Archbishop Leo". The near-immediate result of the council was a major schism. [clarification needed] The bishops that were uneasy with the language of Pope Leo's Tome repudiated the council, saying that the acceptance of two physes was tantamount to Nestorianism. Dioscorus of Alexandria advocated miaphysitism and had dominated the Council of Ephesus. Churches that rejected Chalcedon in favor of Ephesus broke off from the rest of the Eastern Church in a schism, the most significant among these being the Church of Alexandria, today known as the Coptic Orthodox Church of Alexandria. The rise of the "so-called" Monophysitism in the East (as branded by the West) was led by the Copts of Egypt. This must be regarded as the outward expression of the growing nationalist trends in that province against the gradual intensification of Byzantine imperialism, soon to reach its consummation during the reign of Emperor Justinian. A significant effect on the Orthodox Christians in Egypt, was a series of persecutions by the Roman (later, Byzantine) empire forcing followers of the Eastern Orthodox Church to claim allegiance to Leo's Tome, or Chalcedon. This led to the martyrdom, persecution and death of thousands of Egyptian saints and bishops till the Arab Conquest of Egypt. As a result, The Council of Chalcedon is referred to as "Chalcedon, the Omnious" among Coptic Egyptians given how it led to Christians persecuting other Christians for the first time in history. Coptic Orthodox Christians continue to distinguish themselves from followers of Chalcedon to this day. Although the theological differences are seen as limited (if non-existent), it is politics, the subsequent persecutions and the power struggles of a rising Roman Empire, that may have led to the Great Schism, or at least contributed significantly to amplifying it through the centuries. Several Oriental Orthodox Church historians[who?] have viewed the Council as a dispute with the Church of Rome over precedence among the various patriarchal sees. Coptic sources both in Coptic and in Arabic, suggest that questions of political and ecclesiastical authority exaggerated differences between the two professions of faith. The Copts consistently repudiate the Western identification of Alexandrine Christianity with the Eutychianism which originated in Constantinople and which they have always regarded as a flagrant heresy (monophysitism) since it declared the complete absorption of Christ's manhood in his single divine nature whereas the Copts clearly upheld the doctrine of the two natures, divine and human - mystically united in one (miaphysitism) without confusion, corruption, or change. As a strictly traditional church, its religious leaders have sought biblical justification for this interpretation of the Nicean Creed and the Cyriliian formula, but meanwhile have restricted the substance of their variance to interpretation. The Eastern Orthodox Church commemorates the "Holy Fathers of the 4th Ecumenical Council, who assembled in Chalcedon" on the Sunday on or after July 13;  however, in some places (e.g. Russia) on that date is rather a feast of the Fathers of the First Six Ecumenical Councils. ^ Canon 28: "[...] For the Fathers rightly granted privileges to the throne of old Rome, because it was the royal city. And the One Hundred and Fifty most religious Bishops, actuated by the same consideration, gave equal privileges to the most holy throne of New Rome, justly judging that the city which is honoured with the Sovereignty and the Senate, and enjoys equal privileges with the old imperial Rome, should in ecclesiastical matters also be magnified as she is, and rank next after her; so that, in the Pontic, the Asian, and the Thracian dioceses, the metropolitans only and such bishops also of the Dioceses aforesaid as are among the barbarians, should be ordained by the aforesaid most holy throne of the most holy Church of Constantinople; every metropolitan of the aforesaid dioceses, together with the bishops of his province, ordaining his own provincial bishops, as has been declared by the divine canons; but that, as has been above said, the metropolitans of the aforesaid Dioceses should be ordained by the archbishop of Constantinople, after the proper elections have been held according to custom and have been reported to him." ^ Further definitions of the Council of Constantinople (381) can be found on Wikisource. ^ "Definition of Chalcedon". Creeds.net. Archived from the original on 2018-01-26. Retrieved November 5, 2017. ^ Richard Price; Michael Gaddis (2006). The acts of the Council of Chalcedon by Council of Chalcedon. Books.google.com. pp. 1–5. ISBN 0-85323-039-0. Retrieved 2016-11-01. ^ Hughes, Philip (1954). A Popular History of the Catholic Church. Garden City, New York: Image Books (Doubleday). p. 37. ^ a b c d e "NPNF2-14. The Seven Ecumenical Councils | Christian Classics Ethereal Library". Ccel.org. 2005-06-01. Retrieved 2013-08-25. ^ a b Editors, The (1955-04-15). "Council of Chalcedon | Christianity". Britannica.com. Retrieved 2016-11-01. ^ a b Fr. John Romanides (1964). "St. CYRIL'S "ONE PHYSIS OR HYPOSTASIS OF GOD THE LOGOS INCARNATE" AND CHALCEDON". Greek Orthodox Theological Review. X. ^ Tadros, Y. Malaty (1993). "Introduction to the Coptic Church" (PDF). www.copticchurch.net. p. 71. Retrieved 2018-12-07. ^ "Extracts from the Acts: Session V"
^ "Orthodox And Oriental Orthodox Consultation". Romanity.org. Retrieved 2016-11-01. ^ "Questions and Answers by His Grace Bishop Youssef". suscopts. Retrieved 2014-06-10. ^ Donald S. Armentrout; Robert Boak Slocum (2005). An Episcopal dictionary of the church. Books.google.com. p. 81. ISBN 0-89869-211-3. Retrieved 2016-11-01. ^ Meyendorff 1989, pp. 167-178. ^ Schwerin, Philip, How the Bishop of Rome Assumed the Title of "Vicar of Christ", p3, "Leo believed that in him was the voice of Peter. The Fourth Ecumenical Council at Chalcedon in 451 declared that Constantinople had the same patriarchal status as Rome (28th canon), a statement with which Leo never agreed, and which he even tried to declare invalid. When Leo tried to reinstate a defrocked French bishop, St. Hilary who presided over the Gallican Church as Supreme Pontiff, told Leo to keep his Roman nose out of French affairs. Leo’s aspirations were strongly opposed, especially by the patriarch of Constantinople. Yet through him the papacy still gained some ground." ^ a b Bokenkotter, Thomas (2004). A Concise History of the Catholic Church. Doubleday. p. 84. ISBN 0-385-50584-1. ^ a b Noble, Thomas; Strauss, Barry (2005). Western Civilization. Houghton Mifflin Company. p. 214. ISBN 0-618-43277-9. ^ "Chalcedonian Definition". Earlychurchtexts.com. Retrieved 2016-11-01. ^ a b "CATHOLIC ENCYCLOPEDIA: Council of Chalcedon". www.newadvent.org. Retrieved 2018-12-07. ^ Doeswyck, Peter J. (2012). Ecumenicalism and Romanism: Their Origin and Development. Literary Licensing. p. 93. ISBN 9781258514310. ^ The Decrees of the Ecumenical Councils, Vol. 1, ed. Norman P. Tanner, S.J. (1990), 75–76. ^ "L'idea di pentarchia nella cristianità". homolaicus.com. ^ "Merriam-Webster's Encyclopedia of World Religions - Merriam-Webster, Inc". Books.google.com. Retrieved 2016-11-01. ^ Decrees of the Ecumenical Councils, ed. Norman P. Tanner, SJ, 99–100. ^ "Egypt". Berkley Center for Religion, Peace, and World Affairs. Archived from the original on 2011-12-20. Retrieved 2011-12-14. See drop-down essay on "Islamic Conquest and the Ottoman Empire"
^ Butler, Alfred Joshua (1902). The Arab conquest of Egypt and the last thirty years of the Roman dominion. The Library of Congress. Oxford, Clarendon Press. ^ A. El-Moharraky, Pakhoum; Atalla Girgis, Waheeb (1995). The christological teaching of the non-chalcedonian churches. Manchester: Costa Tsoumas. ^ "On the Sunday of the Holy Fathers of the 4th Ecumenical Council, who assembled in Chalcedon". Liturgical Texts — Menaion — July — Holy Fathers. Anastasis — The Home Page of Archimandrite Ephrem. Archived from the original on 2013-12-30. Retrieved 2013-08-28. ^ a b "TA ΜΗΝΑΙΑ — Ιούλιος — Τῇ Κυριακῇ τῶν ἁγίων Πατέρων τῆς Δ' Οἰκουμενικῆς Συνόδου, τῶν ἐν Χαλκηδόνι συνελθόντων". Retrieved 2013-08-28. ^ a b "Богослужебные тексты — Рядовая Минея — Июль — 16 июля: Священномученика Афиногена и десяти учеников его. Святые отцов шести Вселенских соборов" (PDF). Retrieved 2013-08-28. This article incorporates text from a publication now in the public domain: Herbermann, Charles, ed. (1913). "Council of Chalcedon". Catholic Encyclopedia. New York: Robert Appleton.